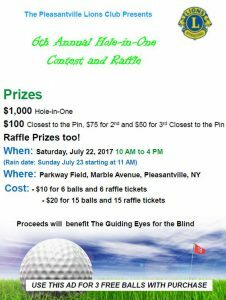 The Pleasantville Lion’s Club is hosting its 6th Annual Hole-in-One Contest & Raffle on Saturday, July 22nd, 10am-4pm, at Parkway Field, Marble Avenue. Click here for details and a list of prizes. Proceeds will benefit The Guiding Eyes for the Blind.